A year and a half ago, we moved away from our little flat around the corner from our school, to a bigger flat a good 20 minutes walk from the school. None of us are morning people, so I knew I had to find a solution for getting young Vivi to school on time. A friend of mine recommended an electric bike. The moment I tested it, I knew I needed one! I now use it to get around all of Paris. Have you ever been on one? It is like cycling normally, except that an invisible hand gently gives you an extra push. When the battery is low, I just take it off the bike and charge it in the flat. It simply is awesome! I love the feeling of getting around Paris overground and getting to know the streets of my city in a different way. 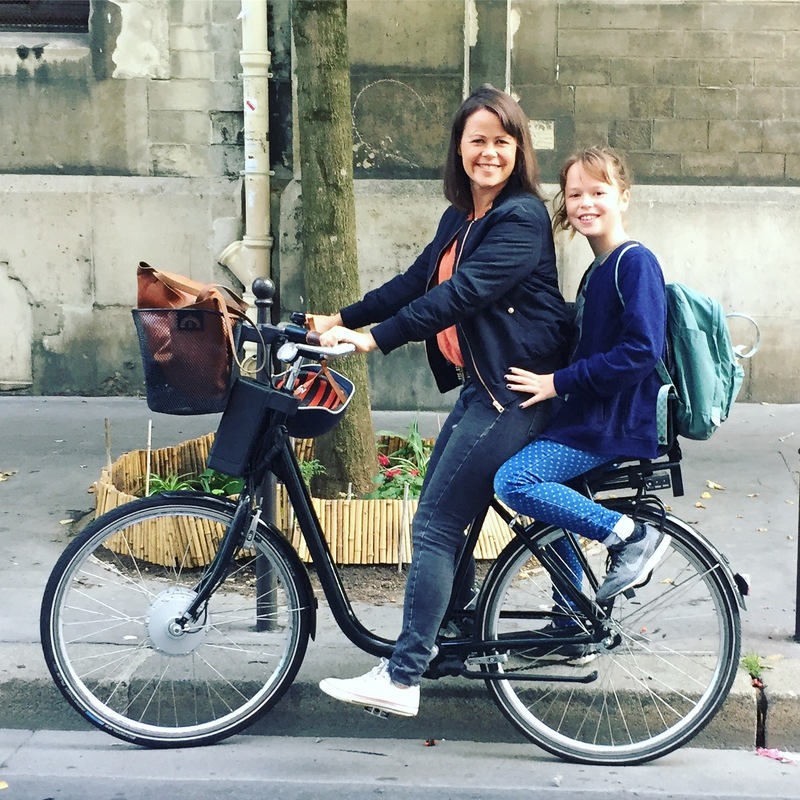 Paris is also getting a lot better at installing cycle paths, so commutes are getting easier and easier as drivers are getting (slowly) used to watching out for bikes. My bicycle is an Askoll and I chose it because it is a smaller model and relatively light. But there are so many models out there to suit everyone. Vivi is now getting too big to jump on the back so our days of travelling as a duo are limited, but I am keeping my bike for sure, I now cannot imagine another way of traveling around! What a great bike! I just got one too but mine is a work cycle bike from Amsterdam. I’m able to place my two oldest on the bench behind me and the youngest on her little seat in front of me. It’s perfect to bike them to their dance studio instead of driving. It’s so much more fun than driving and less stressful. This looks like the ideal mode of transportation! Yes! This is absolutely the best. We have an Xtracycle Cargo bike and a Faraday. This way we can retain a bit of our former European lifestyle and get around our new town of Mill Valley, California without always getting in the car. @Ana you should check out the Bobike Jr., it goes up to 35kg and is frame mounted as opposed to rack mounted. It even comes with rails for panniers.